Update: You can still find Nexus 6P deals, but it's the last-ever Nexus phone, as the Google Pixel and Google Pixel XL debuted in 2016. And since then, we now have the Google Pixel 2 and Google Pixel 2 XL on our hands. Even so, it remains highly recommended if you can find it – especially now that it's been updated to Android Oreo. The Nexus 6P is Google's 2015 flagship Android phablet, and with a 5.7-inch display and lower price, it doesn't stretch your hand, or your wallet, quite as far as its predecessor, the Nexus 6. If you're still considering the 6P, you might be able to get it for a reduced price now that the Pixel and Pixel XL are rolling out in its place, but you won't be able to find it at the official Google Store. The 'P' in the Nexus 6P's name stands for 'Premium', thanks to its all-metal unibody design that's meant to rival the aluminum iPhone 6S Plus and glass-and-metal infused Samsung Galaxy S7 Edge. It's the bigger and more sophisticated-looking version of the plastic-coated Nexus 5X. However, the P could've stood for ... a lot of things: 'Plus', since it requires two hands to operate the phone properly, or 'Palmable', as it's still way easier to clutch in one hand than the 6-inch Nexus 6. 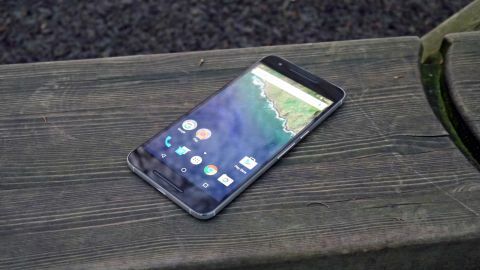 It could also have easily stood for 'Photos', considering the Nexus 6P camera benefits from a 12.3-megapixel (MP) sensor that does a better job than many other cameras in low light; 'Power', as the device uses USB-C for fast charging; or 'Performance', given the top-of-the-line specs and inclusion of Android Oreo. Finally, the 'P' should be popular among bargain hunters for its 'Price'. It now starts at $499 (£449, AU$899) thanks to an early 2016 price drop, and with a little shopping you can find it for a bit cheaper in the US and UK. This makes it easier to go for tempting 64GB and 128GB models upgrades - as does the fact that it's a SIM-free unlocked phone. All of that said, there seems to be an endless number of 5.3- and 5.7-inch phones vying for the same phablet audience: iPhone 6S Plus, LG G5, Moto X Style and Samsung Galaxy S7 Edge and, briefly, the now discontinued Note 7. While the Nexus 6P price is down, the specs have been upped just enough to make this a cost-effective Android contender for our best phones and best Android phones lists. Huawei built the Nexus 6P to be different to any other Google-commissioned phone. Its metal design is undoubtedly a step up from the plastic Nexus 5X, and every previous Nexus. Although relatively flat around the back with barely tapered edges, it feels comfortable in one hand, yet it still takes two hands to operate it properly. This is, after all, a phone with a 5.7-inch display. Its dimensions are 159.4 x 77.8 x 7.3mm, making it just one tenth of a millimeter taller than the Nexus 6, but notably narrower and thinner than its predecessors measurements of 159.3 x 83 x 10.1mm. My overly stretched-out, phone-wielding hands appreciate this change. It went on a much-needed diet to become palmable, weighing in at 178g compared to 184g a year prior, despite Huawei raising the bar on the Nexus 6P specs. Clearly, it was hard to fit everything in. The 12.3MP camera creates an unsightly-looking rear bulge with a black strip, but this eyesore is a fair trade-off given the better low light photos. Everything else has a luxurious look to it. There's a riveted power button with a unique texture, and a smooth volume rocker, on the right side of the frame. There's little chance of mixing up these buttons in the dark. Since arriving on the scene though, we've seen a flurry of new flagship phones sporting similarly impressive premium bodies including the Huawei P9, HTC 10 and Samsung Galaxy S7 - all of which are also easier to grasp with a hand. Of course, their screens are also smaller, so you'll need to decide how big you want to go. There's also no chance that I'll ever put the charging cable in the wrong way. A reversible USB-C port sits on the bottom of the frame, replacing micro USB for faster charging. While a 3.5mm headphone jack rests at the top, I dig the front-facing stereo speakers enough to use them. Too many Androids put the speakers on the back, which makes no sense at all. There's no off-beat color here, in a year when the Nexus 5X has a minty-looking Ice Blue color and the iPhone 6S debuted a popular rose gold option. The Nexus 6P colors keep it simple with Aluminium (gray), Graphite (black) and Frost (white), although at CES 2016 manufacturer Huawei launched the illustrious gold variant of the 6P. Want to customize or protect it? Google has already rolled out multiple cases. I tried out the microfiber 6P case and the very rubber 5X case, and prefer the microfiber option hands down. A leather folio case and elastomer are also options in the Google Store.